The Arizona State Quarter reverse design, created by Joel Iskowitz. Photo courtesy of the United States Mint. The Arizona State Quarter is the 48th coin of the original 50 State Quarterstm Program of the U.S. Mint. The quarters were released in the order that states joined the union. 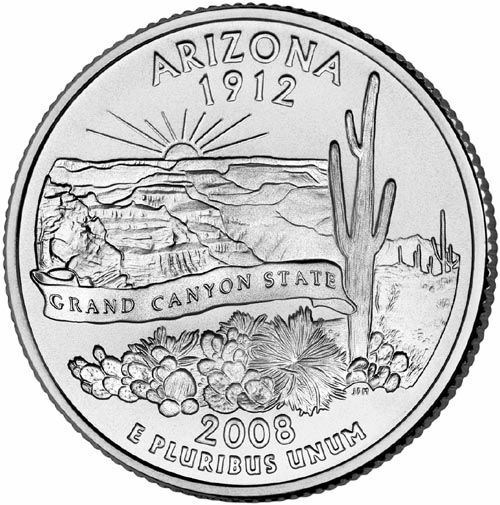 Arizona became a U.S. State on Feb. 14, 1912, which makes the Arizona Quarter the third quarter released in the tenth (and final) year of the Program. (The Washington, D.C. and Territories Program is not part of the 50 State Quarterstm series.) The Arizona Quarter features a Saguaro Cactus in the foreground, with the Grand Canyon in the background, and a banner reading "Grand Canyon State" separating the two designs. The date of admission to the Union, 1912, appears below the state name at the top of the coin, and the year of issue curves along the bottom. The Arizona coin was designed by Artistic Infusion Program Master Designer Joel Iskowitz and engraved by U.S. Mint Sculptor-Engraver Joseph Menna. The coin was officially released into circulation on June 2, 2008. Although the State of Arizona didn't officially appoint an ambassador to spread the message about plans to develop the Arizona Quarter, such a person emerged in the form of commission member Matthew Rounis. Matthew was in the fourth grade at the time he was appointed the commission, and he traveled all over the state giving presentations to his student peers about how important it was to become involved in the Arizona Quarter design process. As part of the State Quarter design process, Arizona submitted five design narratives to the U.S. Mint. These narratives are meant to be very brief and are the basis from which the Mint's artists create the coin designs. Like virtually all of the other State Quarters, the Arizona Quarter design was created by a U.S. Mint artist, rather than a resident of the State of Arizona. This artist selection process has been controversial, and the Mint has taken steps in the past few years to enlarge the ranks from which coin artists are selected through its Artistic Infusion Program. The Grand Canyon in the upper background with the rising sun. In the foreground, the magnificent Saguaro Cactus with several large branches (arms) curving upward. A banner with the inscription "Grand Canyon State" separates the two elements to indicate two distinctive Arizona scenes. Some notes: Navajo Code Talkers were U.S. soldiers in World War II who would pass classified messages back and forth on the battlefield in code based on their native Navajo language. Powell's Grand Canyon survey was an 1869 scientific expedition into the Grand Canyon, the first of its kind. Judging by these voting results, it is clear that Arizona residents feel that the majestic Saguaro Cactus is more emblematic of their state's uniqueness than the Grand Canyon is. Or maybe they just couldn't wrap their minds around depicting the vast and mighty Grand Canyon in less than 1 square, err round inch of space! One of the more interesting design elements on the Arizona Quarter is the banner separating the Saguaro Cactus and desert scene from the Grand Canyon behind it. This banner is an extremely important design element because it is supposed to be telling the viewer that Saguaro Cacti do not grow in the Grand Canyon. I don't think this design element was successful in its goal, though, because of the way the design melds together on the right side. Overall, though, I think the Arizona Quarter is among the better designs in the 50 State Quarterstm series. Although it's a busy design, it is well-executed and pleasing to look at. How Much Is My State Quarter, D.C. and Territories Quarter Worth? What are State Quarters Worth Now? How Much is My Clad Washington Quarter (1965-1998) Worth? What is a Quarter Dollar and Where Did It Come From? How Much Is My Standing Liberty Quarter Worth? How Much Is My U.S. Mint Set Worth? What Caused the "In God We Rust" State Quarter Error?